Season's Readings! At Killer Characters we're giving away a book a day from now till Christmas. Just be sure to leave a comment and you could win the book of your choice from the Soup Lover’s Mystery Series! Happy reading and Merry Christmas! Rick Colgan here. You may think I’m crazy but I know they're after me. You've never met me before so I know it’s hard for you to believe that I’m in danger, but trust me, I am. See . . . I'm Sophie Colgan’s brother. I’m her last living relative in fact. My sister’s friend, Lucky Jamieson, has talked a lot about how much she used to love our big noisy family and I guess we were a real family once upon a time. But not any longer. Dad's gone . . . that's a story for another day. Mom got sick after that and died. Our sister too. And our brother was killed in a car accident a few years later. Everybody’s gone now, except for Sophie and I wish her well, but I’m really coming back to Snowflake to take care of some business and then I’ll be on my way. I don't want to tell my sister I'm in town, not just yet anyway. It's not that I don't care about her -- I do, but in truth we hardly know each other. I was gone by the time she was getting out of elementary school. And my life, well, let’s just say it hasn’t been a bed of roses. I'm doing okay, I’m not real successful, but I’m gettin' by. So I don't wanna rain on her parade. I'll look her up and wish her well while I’m back in town, but it’s not family that brings me back. It's all about our mother's land. The Snowflake Resort wants it and I don't want them to get it. I've got my reasons, suffice it to say, but I don't trust any of those guys in suits as far as I can throw them. I don't think there’s anything they'd stop at to get what they want. That’s the real reason I’m scared. That’s why I know they’re after me. None of us had it easy, but Sophie's the only one of us who seems to be doing well. We all protected her. She was the baby of the family and we kept her safe. She tries to connect with me every so often and she sounds happy. But she's working for the Resort now and that really worries me because I don't want her to become a target too. I’ll tell you some more when Ladle to the Grave comes out on March 3rd. So far, I've been pretty much ignored in the Soup Lover’s Mystery Series and that’s just fine by me, but in a few months you'll probably learn more about our family than you'll really want to know. Don’t forget to leave your email with a comment to be entered in the Season's Readings giveaway! You could win the book of your choice from the Soup Lover’s Mystery Series! And if you’ve already read all the books in the series so far, and don’t mind being patient, you could win an early release of Ladle to the Grave. It's available for pre-order now. Happy reading and happy holidays! You can visit Connie at her website, at Facebook and Twitter @SnowflakeVT. Hi Angel ~ Very best of luck! Thanks for stopping by today! Hi Angel ~ Don't forget to post your email! Oh, sorry - never mind. My screen wasn't showing your email, but now I see it! If I win, I would be happy to wait for an early copy of Ladle to the Grave. This is an awesome series. Oh, thank you, Becky! I think you'll really enjoy Ladle to the Grave! Good luck! I look foreword to learning more about the family. I shall be patient too. I hope you get to meet everyone in the village soon! Thank you for visiting today! I can't wait to learn more about Sophie's family! And to see how Lucky gets involved. Thanks. Hi Sally ~ Great to hear from you today! Good luck!!! Hi Dianne ~ I'm very exciting Ladle is finally (almost) ready to see the light of day! I hope you enjoy it. Best of luck! Hi Debby ~ So glad you discovered Killer Characters. I'm thrilled to be part of such a great group. Good luck today (and the rest of the month)! 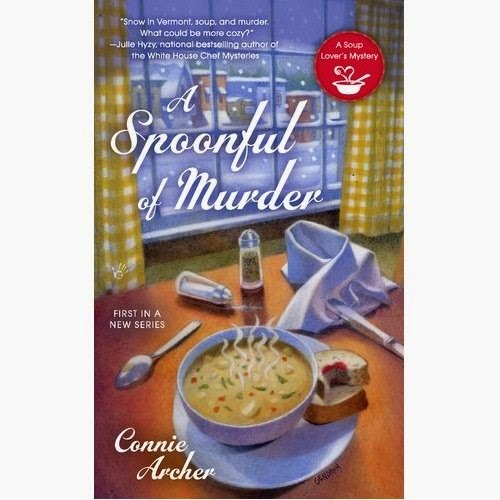 I've read several of Connie Archie's books and loved them—thanks for the opportunity to win! Oh, thank you! I'm so glad you've enjoyed your visits to Snowflake, Vermont! Best of luck today too! I have NOT read the Soup mysteries but would love to give them a try. Hi Caryn ~ Best of luck! I hope you get to visit the village of Snowflake soon. Thanks for visiting today! Hi Raquel ~ Glad you could stop by today. I think you'd enjoy Snowflake, VT. There are lots of stories and adventures in the village! I've only read one book in this series, but I really enjoyed it. Hi Bev ~ Best of luck today, and the rest of the month too. I hope you get to return to Snowflake, VT soon! I wish you the best of luck! I'm really happy we're all doing this giveaway for the holidays! Oh, thank you, Jennifer! So glad you could visit today. Happy Holidays to you too and good luck in the giveaway! Oh, I haven't read any of these. I would love to win the first in the series! You're on the list, Elaine! Very best of luck. I'd love it if you could get to visit Snowflake, VT! Thanks for visiting today! Snowflake sounds perfect! I like winter and snow, but I am out-numbered. My husband hates winter and my mom, whom we live with, doesn't like the snow and ice and cold. So we are heading to the southwest this week. 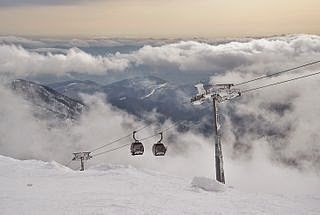 No white Christmas for me ;-( But I bet Christmas is always white in Snowflake! Yes, that's true, Elaine, lots of snow in Snowflake. I'm sorry you'll miss your White Christmas, but maybe there's some snow up in the mountains wherever you're headed. Have a wonderful holiday! A new series for me, but is on my wishlist. Any would be fine with me! Hi Karen~ I think you'd like the village and everyone who "lives" there. Good luck today and thanks for stopping by. new series but I'd like to try it. thanks for the chance. I'd need to start at the beginning. Hi Mary ~ Very best of luck today! I'll put you down for A Spoonful of Murder - the first book in the series. I always like to start at the beginning too and get to know everyone's history! Good luck today! I hope you get to meet everyone in Snowflake, VT soon. So glad you could visit Killer Characters and enter our giveaway! I really enjoy this series and can't wait to read this new book! Hi Bev ~ Thank you! Even more stories of Snowflake are revealed in Ladle to the Grave. Best of luck today! Hi Bev ~ checking all the comments and I realized you didn't leave your email. Can you post it? Or send it privately to ConnieArcherMysteries@gmail.com. Thank you! Great to hear from you today! I hope you get to hear all of Rick Colgan's story in Ladle to the Grave too! Good luck! Looks like another good book in this series. I suppose it will have me wanting to make a pot of homemade soup, too. Hi Sue ~ It's definitely the season for hot soup, isn't it? I hope you get to hear more stories in Snowflake, VT soon! (And there are more recipes too!) Good luck today! Bring on the hot soup! LOL! Lots of plays on words, right? Thanks for stopping by today, Libby! So glad you could visit today! All the best in the giveaway! I have been eyeing your series, Connie. Thanks for the chance to win and congrats on the upcoming release of #4! Thanks so much, Kristin! Good luck in the giveaway too! Hi Kristin ~ Just realized I don't have your email. Can you post it by the end of the day? Thank you! Or you can email me privately at ConnieArcherMysteries@gmail.com. Hi Kim ~ I'm very excited that release day for Ladle is almost here! Good luck today! Can't wait to start reading this series! I only have one book so far but plan to read them all. I like to read series books in order, so often I wait until I have 2 or 3 before I start reading. Hi Loretta ~ I understand, it's great if you can start at the beginning. I hope you enjoy your visits to Snowflake, VT! Good luck today! I haven't read any of the series so I would love to win the first one of the series.Thanks for the chance to win. Hi Donna ~ I'll make a note about that. I hope you can visit the village very soon! Good luck in the giveaway! Don't forget to post your email, Donna! Thank you! I haven't started this series yet, but I would definitely like to very soon! Hi Teresa ~ Wishing you the best of luck! I hope you get to meet everyone in the village very soon! Thanks for visiting today ~ and very best of luck in the giveaway too! Oh, I hope you get to enjoy Snowflake, VT and all the stories there! Good luck today! I'm looking forward to the new book in this series. Hi Sandy ~ thank you! I'm really excited that Ladle will be out soon! Good luck today! I have not yet read any books in this series, so I'd be happy to read any one of them - have heard nothing but good things! Oh, thank you! I really hope you can visit Snowflake, VT very soon! Best of luck today! Hi Jill ~ Here's wishing you win and get to visit the By the Spoonful Soup Shop! Thanks for stopping by today! I don't have this book yet. Thanks for the chance to win! Hi Dawn ~ great to hear from you and good luck in the giveaway! Oops, I posted in the wrong place. Good luck, Ruth, you're entered. Hope you get to visit Snowflake, VT soon! Hi Ruth ~ Thanks so much for stopping by today! Best of luck in the giveaway! Hi Kathy ~ You can learn all about Rick very soon! Thanks for stopping by today! Hi Rita ~ I hope you get to visit the village soon! Good luck today! I have two out of three of these books. I love cozies. Hi Michelle ~ Thanks for entering the giveaway today! Good luck! Hi Barbara ~ So glad to hear you like the By the Spoonful Soup Shop! Best of luck today! I've read the earlier books so I would wait for an early copy of ladle to the grave. Hi ~ thanks for stopping by today! Best of luck in the giveaway! I've been wanting to read a book in this series but haven't had the opportunity to pick one up yet. Thanks for the opportunity to have a chance to win a copy. Hi Robin ~ It's early morning where I am, so I'm checking the later arrivals. I will add your name. Good luck! PS: if you get this in the next hour or so, please send your email to ConnieArcherMysteries@gmail.com. Thank you! Hi Virginia ~ Good luck in the giveaway. I'm checking all entries till midnight last night. I would love to win Roux of Revenge! Thank you for the opportunity to win a book in this fabulous series. Love these books !!!!!!!! Hi Lexie ~ So glad you could stop by! Good luck! I'll be posting a winner in the next hour or so! Can you please send your email to ConnieArcherMysteries@gmail.com? (I'll check, I may already have your email. Thanks! So excited that there is a new in the series! Can't wait to read the newest! Hi Alicia ~ Great to hear from you!! I'm really excited that Ladle is almost out! Good luck! Hi Melissa ~ So glad you could stop by! I hope you get to read about the latest adventure in Snowflake, VT very soon! This is a new series for me but sounds great. Thanks so much for visiting! I hope you get to meet everyone in Snowflake, VT soon. Good luck! I really like this series. Thanks for the chance to win. Thank you, Valerie! 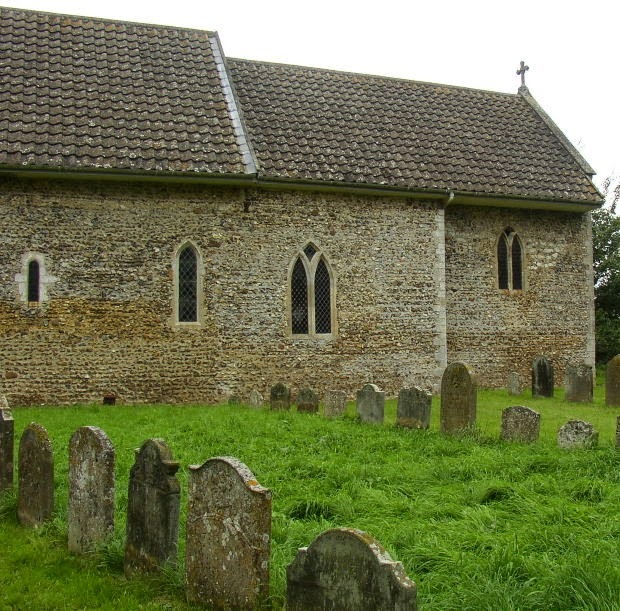 I think you'll really like Ladle to the Grave too. Best of luck in the giveaway! More books for my list! What's the expression? Too many books, never enough time??? Best of luck in the giveaway. I hope you're able to visit the village very soon! Good luck! I hope you get to meet everyone in the village and enjoy their stories! Thanks for stopping by! 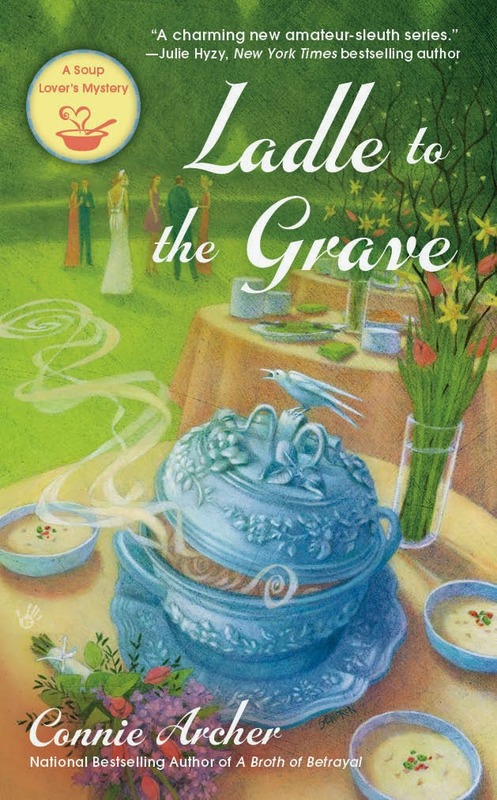 I've got the first three books in your Soup Lovers series and I can't wait for the next one ~ 'Ladle to the Grave'! 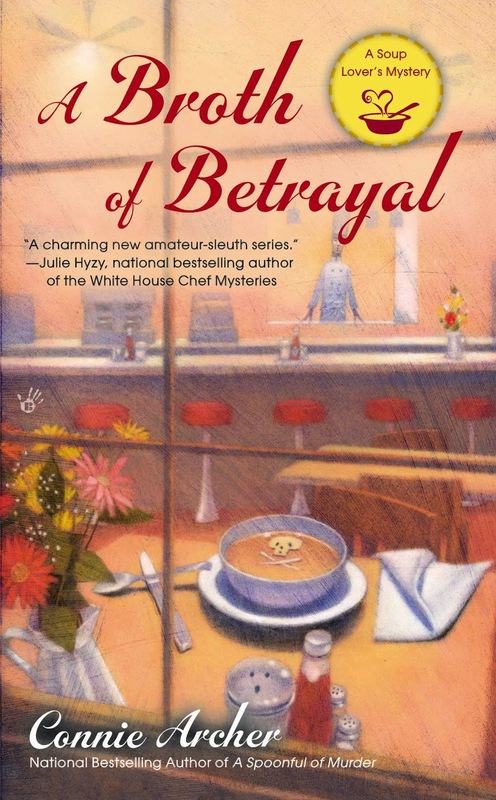 There's nothing like a nice hot bowl of soup on a chilly winter day ~ except maybe a cozy little mystery! Thanks so much & happy holidays! Oh, thank you! I'm so happy to hear you've enjoyed Snowflake and the By the Spoonful Soup Shop. And glad you could stop by. Good luck in the giveaway! I'll be posting the winner in another hour or so. Happy holidays to you too! Hi Kaye ~ Thanks so much! And thanks for visiting Killer Characters! Best of luck in the giveaway and I hope you get to come back to Snowflake, VT soon! Hi Patricia ~ I'm so glad you enjoyed Roux! I hope you enjoy every visit to Snowflake, VT. Lots of stories there and lots of adventures. Good luck!!! Oh, I hope you get to visit Snowflake, VT soon and meet everyone there. Best of luck in the giveaway! 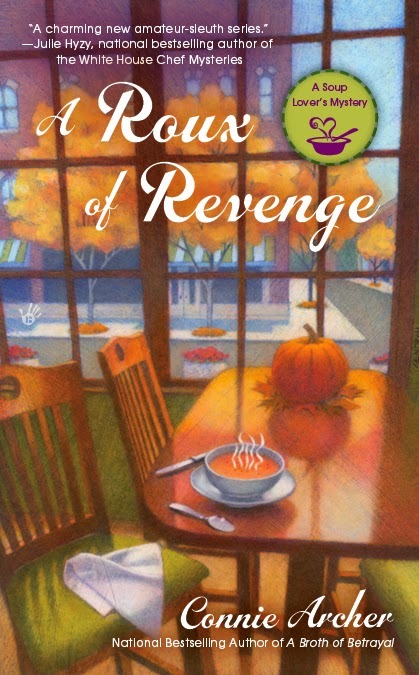 Hi Margo ~ I'm glad I could introduce you to the Soup Lover's Mystery series! I hope you get to enjoy the village soon! Best of luck! Thanks for stopping by Killer Characters! And good luck in the giveaway. If you could send your email to ConnieArcherMysteries@gmail.com in the next hour or so, that would be great. Good luck! I'd love to read one of these! Thanks for visiting Killer Characters! And good luck! Don't forget your email. If you like, you can send your email to ConnieArcherMysteries@gmail.com. I'll be posting a winner in the next hour or so. Good luck! Hi Kiki ~ Thanks for visiting. Good luck today! Sorry for not leaving my email yesterday, Connie! The address is bg9246@hotmail.com. Hi Bev ~ got it. Thanks for sending it. All the best to you and thank you for visiting Killer Characters! Thanks to everyone for stopping by Killer Characters! I've just posted the winner (chosen by random.org) on the website. Happy holidays to all! Got hooked on this series this summer. Love it!!!! !